Shew. It was actually a good weekend. By Sunday evening I felt like it had been longer than usual. Unheard of, really. So yes, good, aside from this whole being sick thing. No, not morning sick, coughy-snotty-sneezy sick. It is driving me nuts. I've been taking the same stuff the Doc gave me last time (about all I can take, apparently) ... and this morning I'm actually feeling a little better for the first time in days. It's typical tho, only really bad in the mornings and evenings. Vampire Flu, anyone? On Saturday The Trucker was up early sorting out the tiler for our patio and buying the gutters etc. Very exciting. So yes, the next phase of Patio is complete and looking fantastic. I love the tiles we chose, they hide the dirt (which is why I wanted something darker) and they are non-slip. And just generally awesome! Can NOT wait for The Trucker to fix the bamboo to the roof and put the gutters up and it to be pretty much done (there will still be one or two little things to finish but it'll be usable). In the afternoon we did the annual pilgrimage to Taste of Joburg (full blog post coming). It was awesome, but shew, a hot afternoon! We didn't stay very late and then didn't do much for the rest of the day. On Sunday we took back the last box of tiles (one of two that I'd rushed out to buy at the last minute yesterday) and some unopened grouting before heading to breakfast at Doppio and then grocery shopping. 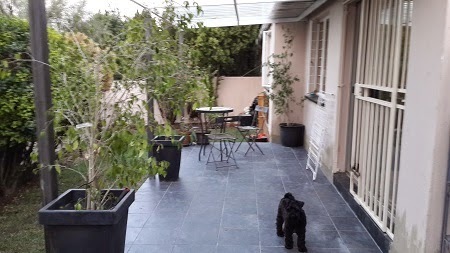 When we got home, we cleaned the tiles (they were still covered in the grouting dust) and put everything back on the patio. And then The Trucker mowed the lawn! 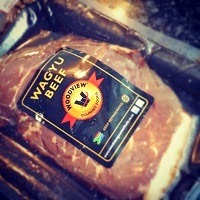 In the evening he cooked us some Wagyu beef (from Taste) and made us some Smoky Mash (we also bought ourselves some Liquid Smoke at Taste). Dinner was amazeballs!